Can you find growth in Japan? Blog Can you find growth in Japan? It’s a simple question, but considering the headwinds Japan’s economy faces – not least a shrinking population, labour shortages, persistent deflation and the prospect of a tax hike later this year – few would expect a positive answer. Yet over the past 21 years, attendees of Credit Suisse Asian Investment Conferences (AIC) have got used to hearing contrarian views and unconventional forecasts. Would the “Japan Track” on Day 3 of the 22nd AIC provide another surprise? Tomomi Inada, Special Aide to the President of Japan's Liberal Democratic Party (LDP), Member of the House of Representatives and lawyer, discusses Abenomics at the AIC. 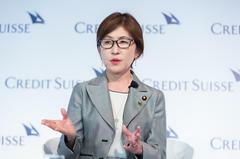 In her address, Tomomi Inada, Special Aide to Japan’s Prime Minister Shinzo Abe, was certainly upbeat, describing the achievements of “Abenomics” as well as the work that remained to be done. Abenomics’ three “arrows” – bold monetary policy, flexible fiscal policy, and a growth strategy to encourage greater private investment – have been fired with mixed success. Inada admitted that the Bank of Japan has yet to hit its 2% inflation target, though stock markets and corporate earnings have risen and unemployment has fallen. This last point is partly because workers are in short supply. Japan’s National Institute of Population and Social Security Research estimates that the working-age population will fall an average of 1.1% per year over the next 50 years. “This is going to put a huge burden on the economy,” Inada warned, outlining how the government has revamped residence requirements to allow more foreign workers to help fill the gap. Hiro Shirakawa, Vice Chairman and Chief Economist, Japan of Credit Suisse discusses opportunities for growth in Japan at the AIC. But back to the original question: can Japan grow despite these headwinds? As the old adage has it, there is opportunity in adversity. Hiro Shirakawa, Credit Suisse Vice Chairman and Japan Chief Economist, took up this theme in his remarks. Take the tax hike. If it goes ahead, it could be an opportunity for cash-loving Japan to finally adopt e-transactions in greater numbers, Shirakawa said. When the 2-percentage-point consumption tax rise comes in, the government is planning to offer a 5% subsidy for non-cash payments at small retailers, likely boosting those forms of payment and unlocking efficiency gains. The labour shortage, meanwhile, is boosting productivity among hard-hit sectors, notably construction, Shirakawa noted. It has also helped push up female labour participation – another focus of Abenomics – although Inada admitted that Japan was still at the starting point in terms of getting women into senior management positions. Two issues that could be problematic, Shirakawa noted, were a generally lower interest among Japanese people for starting companies, and a shortage of venture capital. This totalled around 0.04% of Japan’s GDP in 2018, compared to 0.4% in the US. But here too, adversity is likely to provide an impetus, Shirakawa reckoned, not least as declining lifetime earnings prospects force younger Japanese workers to take matters into their own hands. And although starting from a low base, the number of VC and corporate VC-backed projects has been steadily rising for several years. 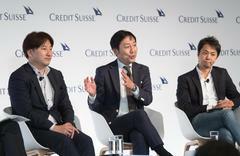 CEOs of three emerging companies in Japan discuss how they are combating some of the macro headwinds currently faced by Japanese society and businesses. There was no shortage of evidence of the vibrant potential of Japanese innovation at this year’s AIC. On one panel, the CEOs of three platforms and aspiring unicorns – HEROZ, Kamakura Shinsho and Raksul – each argued how their business models are set for domestic success. The forces driving growth for Kamakura Shinsho – a portal matching elderly people with providers of “end of life” services such as funeral homes – needs little explanation in a country where over one quarter of the population is aged over 65, and deaths are set to outnumber births by 400,000 a year, explained CEO Hirotaka Shimizu. Raksul founder and CEO Yasukane Matsumoto explained how his company, which sets up platforms to maximise the usage of underutilised assets like printing machinery and trucks, also focuses on the opportunities to improve efficiency in what is still, after all, the world’s third-biggest economy. So the answer to the question posed at the top of this article is a definite yes – if you know where to look. At the 22nd Asian Investment Conference, we explored disruption across financial markets, geopolitics and technology. An impressive line-up of speakers shared their views on how to chart the future amidst continuous change.